Windows 7 is a great operating system, but it's not yet fantastic. Like us, you'll probably have come up against some of its most irritating shortcomings in the time since you installed it on your PC. Icons are missing, utilities have been dropped and functionality has been reduced in some areas. Certain tools are still as hopeless as they were in Vista, and other long-term Windows issues also remain, including inadequate security features and application-related slowdown. "Service Pack 1 includes only minor updates, among which are previous updates that are already delivered through Windows Update." That's really not good enough. We think Windows 7 needs many tweaks before it reaches the standard that we expect of it. As it doesn't look like Microsoft is going to provide them, we've set out to fill the gap and built our own unofficial service pack, which is absolutely packed with new features and essential upgrades. We've included tools to plug long-standing security gaps, apps to boost productivity and utilities to keep your PC running at its peak performance. The PC Plus Service Pack will refresh the interface, simplify networking, add new entertainment options and fix many well-known Windows 7 annoyances. So why wait for Microsoft? We've got all the service pack functionality that you need right here. 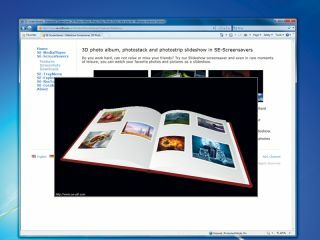 Windows 7 looks great, and its interface is a major step forward in many ways. There's no confusing mass of tiny buttons on the taskbar – just a single icon per app. Hover the mouse cursor over the Firefox icon and thumbnails will appear for every Firefox window that you have open. Hover the mouse over a particular thumbnail and that window will be highlighted. You can then click it to switch to that app. It's an easy way to locate the window you need, no matter how cluttered your desktop. Jumplists are another timesaver. Right-click the Windows Media Player icon and you can choose to replay a recent video. Notepad's jumplist similarly displays the last file you saved, while IE's includes your recent browsing history. Then there's Aero Shake (shake a window by its title bar to minimise all other windows, or bring them back) and Aero Snap (drag and drop to align windows to the left or right half of your screen) as well as some appealing Windows themes and gorgeous backgrounds, along with better ways to use them (like the ability to have the desktop slowly cycle through your favourite images). Let's be frank, though. There are problems, too. Explorer has never been the best of file managers, and in many ways the Windows 7 version has got worse. It no longer remembers folder sizes and positions, so you have to keep relocating windows manually. The status bar no longer shows the size of the files you've selected, or the free disk space. There are other strange omissions. If you found it useful that the network icon flashed to indicate traffic, for instance, then you're out of luck – it's gone. Some of the new features aren't that useful, either. Jumplists only work with apps that support them, which right now isn't many. And pinning applications to the taskbar sounds good, but space quickly runs out. Configuration options are notable by their absence. The Aero Peek taskbar thumbnails are a little small, for example, but Microsoft provides no obvious way to change their size. For the answer to this and many other Windows 7 interface issues, you'll need to turn to a more capable source: the PC Plus Service Pack. Windows 7 has some great and exciting new wallpaper images, but there aren't enough of them. If you haven't found one that really takes your fancy – or if you prefer to have several on rotation – then you should try Microsoft's Bing's Best packs. These include spectacular Bing photos, custom sounds and other items that you can use to customise your desktop. The Windows 7 screensavers are disappointing – they're just a subset of those bundled with Vista last time round. So we think you should add a little variety with SE-Screensavers. There's a configurable Matrix-style screensaver, an animated kaleidoscope, a spectacular 3D slideshow and several others all designed to give your vacant screen a little bit of oomph. Jumplists normally only work if a program supports them – but Jumplist Extender changes the rules. In just a few clicks you can create custom jumplists for any application. These can launch a program with a command-line switch or automatically perform any of its commands. Built-in AutoHotKey scripting lets you automate more complex tasks. If that's too complicated, import someone else's extensions and use those. No one knows why, but Windows 7 saw Explorer lose its option to remember the position and size of particular Explorer folder windows. Now you must rearrange them manually – unless you install the simple tool ShellFolderFix. Are you missing old Explorer and Start menu features? Classic Shell is a collection of tools to bring them back. There's a fully customisable clone of the old Start menu (it doesn't completely replace the Windows 7 menu so you can use both), an Explorer toolbar adds useful shortcut buttons and it makes the status bar show the free space and size of your selected files, just as it used to do. There are many other tweaks, too. 7plus delivers a host of productivity-boosting interface tweaks to Windows 7. You're able to add favourite folder buttons to Explorer toolbars, for instance – just click one to jump there. Mouse shortcuts include right-clicking a window title bar to set it as 'always on top', or middle-clicking to close a window. There are also keyboard shortcuts to create folders, upload files to FTP sites, paste previous clipboard entries and more. Windows 7 saw the unfortunate end of the useful network activity indicator, the icon that would flash to indicate incoming or outgoing network packets. But don't worry – this tiny program brings it back, better than ever before. Right-click the icon and you'll find you can now configure everything from the icon blink rate to the network interface and even the packet type (TCP, UDP or ICMP) that will make it flash. Pinning shortcuts to the taskbar sounds like a good idea, but you will run out of space very quickly. Jumplist Launcher amalgamates shortcuts for many diff erent applications and tasks – up to 60, in fact – into a single, well organised jumplist. To reduce clutter, add lesser-used shortcuts here (and your desktop shortcuts, maybe) and leave the rest of the taskbar for more important applications. Windows often forgets the size of a window you'd like to use for an application, but AutoSizer will quickly rectify this problem. Leave it running in the background and it'll keep particular windows at a specific size, or keep them maximised (perfect if you're tired of forever maximising new IE windows yourself). It can even maximise apps to the display you specify on a multi-monitor system.